Tile refinishing is an outstanding alternative to replacement, adding years to the useful life of most kitchen and bath surfaces, while providing unlimited color and decorating options. 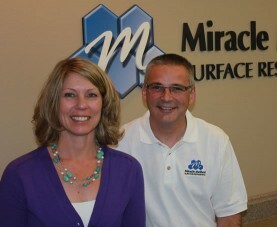 Each Miracle Method franchisee is a skilled craftsman who uses only the best materials and takes pride in his work, offering a limited five-year warranty against adhesion failure on your refinished countertop. Most brand new countertops come with a one-year warranty for poor workmanship or manufacturer defects. However, each individual Miracle Method franchise covers its workmanship and provides a five-year warranty against peeling or failure of adhesion. Ask for a copy of the Limited Warranty offered by your local franchise.